When we look at the collections of short stories and novels from Taiwanese literature, we are surprised to find that, after several publications in the 2000s, including two collections directed by Isabelle Rabut and Angel Pino (1), no new books until 2016. Three books are then published to which we will come back later: a special edition on Taiwan from the excellent journal Jentayu (3), a good collection “Taipei, history around the corner” published by the Asiathèque (4) and six “Nouvelles de Taiwan” in 2018 (5). But a publication created the event at the beginning of 2017: the Anthologie historique de la prose romanesque taiwanaise moderne, two volumes under the direction of Isabelle Rabut, professor at INALCO and Angel Pino, professor at the Université de Bordeaux Montaigne. The first book, “Le petit bourg aux papayers” (6) introduces us to writers of the colonial period and short stories in Chinese and Japanese. The second volume, “Le cheval à trois jambes” (7), deals with the transfer from Japan to China, the massacres of the 28th of February 1947 and the exile in Taiwan of Chang Kai-shek’s supporters. The introduction of martial law, in force until 1987, was accompanied by literary repression (Chinese left-wing literature, prohibition of the use of Japanese and Taiwanese dialects, etc. ), which did not succeed in suppressing modernist groups. These two books were presented in February 2017 at the Centre Culturel de Taiwan in Paris, where two documentaries on the writers Lin Haiyin and Wang Wenxing were also screened. These two volumes, like the next two, are carefully set up: introduction by publishers with the translated works in the economic, political and cultural context of the time; biographies and introductory comments on authors and works are very useful, as are notes, which are often essential. They have just been released and will be presented by the publishers at the “Librairie Le Phenix” in Paris, on Friday, February 1st at 6pm and at the Taiwan Cultural Center on the 10th of February. The third volume, “De Fard et de Sang” (8), deals with the evolution of Taiwan’s international position, its domestic politics and the controversy surrounding local literature. We are pleased to find authors already translated into French (and English…) such as Huang Chunming, Zhang Xiguo (Chang Shi-kuo), Wuhe and Li Ang whose novel gives the volume its title. 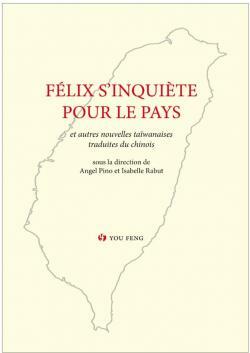 The last volume “Felix s’inquiète pour le pays” (9) takes as its title a beautiful short story by Zhang Dachun. This volume includes a vast amount of information and we will detail the main writers translated and reference the articles we have devoted to them in the past. The editors highlight the complexity of relations with China and the evolution towards democracy after the end of martial law in 1987. The changeover between political parties, between KMT and PDP is taking place; a woman, Tsai Ing-wen, from the PDP, is elected President of the Republic in 2016. Taiwanese culture is valued as well as aborigines and their languages; the history of white terror is clearly addressed but tensions are ongoing between those who advocate independence and those who support reunification. For publishers, Taiwan’s literary history “is not considered in terms of literary trends but according to the groups… who live together on the island, even if they claim more and more the same Taiwanese identity”. The literature of “garrison villages” provides a good illustration, addressed by a collection in 2001 (2), developed by a book devoted to the Chu family (1) and analysed by an article by Angel Pino (10) and a conference at INALCO in October 2014. Many short stories had already been translated (1 and 2) but the “Nineteen Days…” were only available in English (11). In the autumn of 1988, when the capital gains tax was announced, the Taipei Stock Exchange dropped sharply. With a lot of humour, Zhu Tianxin tells us about the changes in the life of a mother. She’s trading with a friend, reading the financial newspapers without telling her family. The attitude of the KMT and the PDP towards the stock market, large and small speculators, becomes the topic of family discussions. 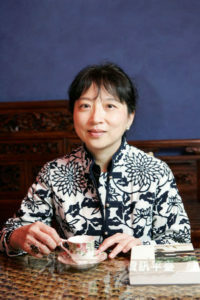 Zhu Tianwen, the older sister, is too often presented as the scriptwriter of a major filmmaker, Hou Hsiao-hsien. The Asiathèque has published two scenarios: “The City of Pain” and “The Assassin”. 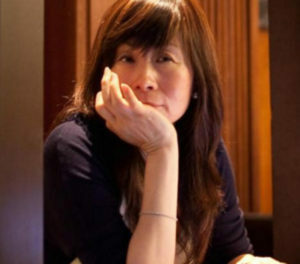 She is a leading writer who, in 2015, was awarded the Newman Prize, succeeding Mo Yan, Han Shaogong, Yang Mu. The prize was awarded precisely for a collection of eight short stories, published in 1990, including “Splendour “(14). – Su Weizhen: Part of the way with him (p.119 to 149). Fei Min, after graduating from university, joined a newspaper; she is living a love story during a few months with a man, a sculptor and then commits suicide. She wanted to put all her heart into this story; “to make someone her friend, you have to devote your whole life to him”. This man is transparent and secretive, concerned above all by his social success. She puts aside everything that has no connection with him because he needs “much, much love”. Some of these female voices have been classified as “boudoir literature”. The success can be explained by the importance of the female readership and the proximity of some of them to the nationalist power. I admit I wasn’t really won over. Another short story “Image of Xiao Wei” had already been translated into French (2); it is about two sisters who are opposed in everything… Four other short stories have been published by Bleu de Chine (12). Su Weizhen is an important personality, author of about twenty books, several of which are devoted to Eileen Chang. She was for a long period editor of the United Daily News Literary Supplement. – Ping Lu, death in a cornfield (pp. 74-112). 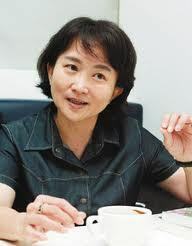 Born in 1953, Ping Lu worked in the United States then in Taiwan as editor-in-chief of the China Times; she is currently the director of Radio Taiwan International. She drew attention to herself with a novel about the couple formed by Sun Yat-sen and Soong Ch’ing-ling (13). In a cornfield near his home, a young Taiwanese man is found dead; the police doesn’t mention homicide. The narrator, a Washington correspondent for a Taiwanese newspaper, will investigate. Their difficult married lives bring them closer together. The deceased is probably on a blacklist in Taiwan because he participated in the Diaoyutai Islands movement during which young Taiwanese in the United States condemned the government’s inaction and were close to mainland China. A great short story published in the United Daily in 1983 (and translated into English) (15): the wife, a colleague, his daughter, a classmate, recall the character of the dead man. The corn field recalls the memories of the sugar cane fields and the narrator will return to Taiwan and divorce because his wife wants to stay in the United States and does not want children. 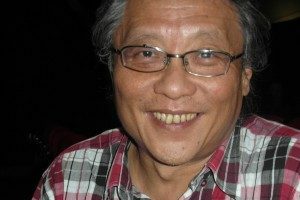 Zhang Dachun is one of the most famous writers, he came to Paris in October 2016 at the Cultural Center of Taiwan, to present the memories of three generations of his family. Born in 1957, he has worked in many media (radio, television) and has tried all literary genres. Several of his novels have been translated, including in French “Enfant des Rues” and a collection of short stories entitled “La stèle du général”. “Felix” is of high quality. The hero is a sweeper in a garrison village and Bonheur, his eldest son, helps him to read the President’s proclamations. He died on April 5, 1975; from then on, everything went wrong. Félix collected the proclamations and started writing articles, but how to get published. No answer when he writes to the newspapers. He had 4,000 copies duplicated and distributed along the streets he swept. A lot of humour and impertinence about politics and politicians! (1) Isabelle Rabut and Angel Pino, “Anthologie de la famille Chu”, Christian Bourgois éditeur, 2004, 328 pages. (2) Isabelle Rabut and Angel Pino, “A mes frères des villages de garnison”, Bleu de Chine 2001, 285 pages. (3) Jentayu. Special edition; number one: Taiwan, 2016, 250 pages. (4) “Taipei, stories around the corner”, Preface by Gwennaël Gaffric. Asiatheque 2017, 230 pages. (5) Short stories from Taiwan; Magellan et Cie, March 2018, 175 pages. (6) “Le petit bourg aux papayers”, under the direction of Angel Pino and Isabelle Rabut. You Feng 2016, 380 pages. (7) “Le cheval à trois jambes”, under the direction of Angel Pino and Isabelle Rabut. You Feng 2016, 330 pages. (8) “De fard et de sang”, edited by Angel Pino and Isabelle Rabut. You Feng 2018, 460 pages. 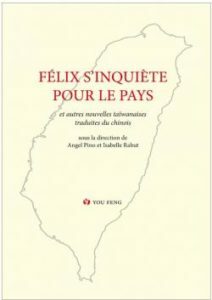 (9) “Felix s’inquiète pour le pays”, edited by Angel Pino and Isabelle Rabut, You Feng 2018, 440 pages. (10) Angel Pino, “Taiwan, la littérature des villages de garnison”, Les Temps Modernes, July-September 2014, pages 145-184. (11) Zhu Tianxin, “Nineteen Days of the new party”, translated by Martha Cheung in City Women, Renditions 2001. (12) Su Weizhen, “Séparations”, short novels translated by Véronique Jacquet-Woillez, Bleu de Chine 2005, 149 pages. (13) Ping Lu, “Le dernier amour de Sun Yat-sen, translated by Emmanuelle Péchenart. Mercure de France, 2008, 264 pages. Translated into English by Nancy Du under the title “Love and Revolution”, Columbia University Press 2016, 165 pages. (14) Zhu Tianwen, “Fin de siècle Splendour », translated by Eva Hung; p.43-66; Renditions 2001. (15) Ping Lu, « Death in a cornfield”, translated by Chang Jun-mei Chou p.135-151; HK Oxford University Press, 1994.